Kuwaiti Emir Sheikh Sabah al-Ahmed al-Sabah (C) chairs the 38th Gulf Cooperation Council (GCC) Summit at Bayan Palace, Kuwait City, Dec. 5. The emir of Kuwait called for the formation of a committee to look into modifying the structure of the six-member Gulf Cooperation Council (GCC) amid ongoing diplomatic rifts. 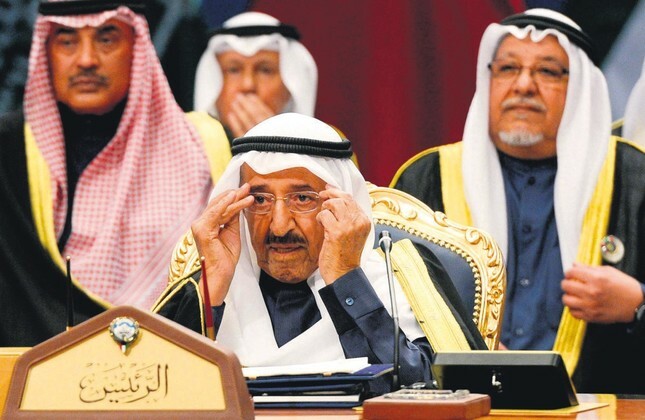 "We might change the system of the GCC to have mechanisms to better face challenges," Sheikh Sabah IV Ahmad al-Jaber al-Sabah said, as reported by the Doha-based Gulf Times. "Any dispute at the Gulf level must not affect the continuation of the summit." A planned two-day summit of Gulf Arab countries fell apart within hours of starting Tuesday over the ongoing boycott of Qatar, underscoring the difficulty of ending the crisis and suggesting that unifying the bloc of U.S. allies is slipping further from reach. Just before the start of Tuesday's summit, the Emirati Foreign Ministry said the new "joint cooperation committee" with Saudi Arabia was approved by United Arab Emirates (UAE) ruler and President Sheikh Khalifa bin Zayed al-Nayhan. The UAE and Saudi Arabia have cultivated close ties in recent years. Emirati troops are deeply involved in the Saudi-led war in Yemen. Abu Dhabi's powerful crown prince, Mohammad bin Zayed al-Nayhan, is believed to be close to Saudi Arabia's young Crown Prince Mohammed bin Salman. The Emirati announcement did not say whether any other Gulf Arab countries would be invited to join the new group, but the implication was clear that the two Gulf powers could strike out on their own. Tuesday's meeting in Kuwait City was to be a summit of the region's rulers. However, only Qatar and Kuwait were represented by their ruling emirs, sparking anger online from Kuwaitis that the nations boycotting Qatar had slighted their leader. Despite the troubles, Kuwait's Sabah tried to stay positive. "The past few months have seen several painful incidents and negative repercussions, but we believe that wisdom will prevail," he said. "Our meeting today is an indicator that we shall continue our efforts to resolve the crisis." But after a closed-door meeting lasting around 15 minutes, Sabah announced the end of the summit to applause. GCC Secretary-General Abdullatif al-Zayani tried to downplay ending the meeting early, saying others had concluded just as quickly. But he avoided directly discussing Qatar with journalists. The GCC, composed of Bahrain, Kuwait, Oman, Qatar, Saudi Arabia and the UAE, formed in 1981, in part as a counterbalance to Shiite power Iran. It is no stranger to disputes among its members, especially during the mid-1990s. Since then, the group had grown clubbier, buoyed by rising oil and energy prices. It made visa-free travel arrangements among its members and pushed toward greater economic cooperation. But a drop in oil prices, the 2011 Arab Spring and its aftermath, and other political maneuvers led to the Qatar diplomatic crisis. The dispute began in June, following what Qatar described as a hack of its state-run news agency and the circulation of incendiary comments attributed to its ruler, Sheikh Tamim bin Hamad al-Thani. Soon after, GCC members Bahrain, Saudi Arabia and the UAE closed their airspace and seaports to Qatar, as well as the small peninsular nation's sole land border with Saudi Arabia.